Before CES 2001 and after my review of the JoLida JD 302 integrated amplifier, I had a discussion with JoLidas Michael Allen about speakers. He was awaiting delivery of his personal pair of the Cliffhanger Bulldogs, and he asked if I had ever heard them. I had not, but I remembered that Doug Schneider had reviewed them. Allen proceeded to tell me that despite Dougs recommendation for a high-wattage solid-state amplifier with the Bulldogs, he knew that the speakers liked tube amplifiers too -- as long as the amp has enough power to drive the speakers. At the CES, I had the opportunity to hear the Bulldog's in JoLida's room, and they did sound pretty good, but as always, I had to reserve final judgment until I could hear them in more familiar surroundings. A few months ago, Michael Allen called to invite me over to hear his Bulldogs along with his brand-spanking-new 200-watt JD 3000A monoblock amplifiers. Anxious to hear the pairing, I took a drive to Annapolis Junction, Maryland for a listen. I had a blast. Whats more, I was also fortunate in that Michael Allen allowed me to take the amps and speakers home for a listen -- and this follow-up review. As I loaded the speakers into my car, I couldnt believe how heavy they were. Later I found out that the Bulldogs are constructed of 3/4" MDF and have steel plate on all interior panels. They also incorporate extensive use of full-plane horizontal and vertical bracing. These speakers are solid. Inside, Cliffhanger forgoes the usual fiberfill for synthetic wool, which they claim has a more consistent density. Cliffhangers Ian Smith tells me that the bass ports are internally treated to reduce turbulence and chuffing for a more linear performance, and he claims that the premium parts used in the crossover include Goertz Alpha-Core inductors, Hovland capacitors, and metal-oxide resisters. Once the speakers were home and on stands, I was surprised how domestically friendly these maxi-monitors are. Though the Bulldogs are somewhat large for stand-mounted speakers, the high-gloss finish of their baffle looked classy, and when perched on stands, the speakers just didnt look all that imposing. Small speakers, small room -- not! My natural inclination was to place these stand-mounted monitors in my 150-square-foot listening room, which I did. Here they sounded as robust as all get-out. They had deep bass, and presented a very warm character with a friendly rounded tone overall, very clean midrange, and good detail. Then, on a lark, I moved them to my almost thrice-the-size family room, and they absolutely exploded to life. Imaging and soundstaging took a giant leap forward as everything just blossomed. Shockingly and paradoxically, dynamics opened up as the speakers were given more breathing room. My favorite recording of Carl Orffs Carmina Burana [RCA Victor Red Seal 09026-61673] sounded somewhat stifled in the smaller room, but it sounded absolutely liberated in the larger room. Microdynamics, in particular, took on greater prominence once the musical gaps were not filled with bass energy that the smaller room could not dissipate. In the larger room, the highs opened up, the sound was more illuminated and natural, and the speakers overall balance improved. Here is a tweeter whose output directly reflects its input with very little editorializing. When things are good, they are very good. But when the recording sizzles, so does the tweeter, though to the same magnitude: it does not add to the discomfort. Chimes and triangles from "Gaia," on James Taylors Hourglass [Columbia CK 67912], for example, have a tangible quality that is defined by utter delicacy. And the brushed snare on "River of Tears" from Eric Claptonss Clapton Chronicles - The Best of Eric Clapton [Reprise 947553-2] have all the detail required to prevent them from sounding like white noise. The midrange was neutral and natural -- and slightly forward. It was highly detailed but in a way that did not put it in your face. Highly uncolored, male and female vocals sounded authentic. Overall, the Bulldogs threw a very meaty midrange presentation as compared to my more ethereal Silverline Sonata IIs, which are a little more transparent but give up some of the tangible nature of the Bulldogs. The speakers struck a balance between incisive and rounded that is just a touch on the incisive side, but without the supernaturally razor-sharp presentation of the JMlab Mini Utopia. And then there is the bass. Even Cliffhangers specs dont seem to do the speaker justice -- -1.5dB at 50Hz, -3dB at 37Hz and -6dB at 28Hz -- that is, unless you understand how deep 40Hz actually is: very healthy extension for any speaker that can reproduce it at a high enough level. Most small monitors can indeed pass a 40Hz sine wave, but at what volume? Pump up the SPLs and the speaker will either compress like mad or it will run out of excursion and start slamming against its woofer stops. Not the Bulldog. What sets it apart from the vast majority of stand-mounted monitors is that it has an honest response that it can deliver at high volume settings without running out of gas. 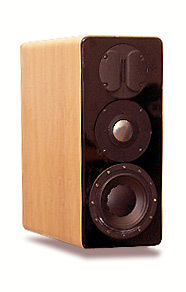 The Totem Mani-2 has a similar low-end response, but despite its compound woofers, it cant match the output of the Bulldog. The Bulldog is not a match in terms of SPLs for a good subwoofer. I was able to bottom out the woofers with the synthetic bass line from Depeche Modes "Behind the Wheel" from Music for the Masses [Sire 9 25614-2]. But I was cruising at about 93dB+ at my listening seat, which is louder by far than I normally listen. When I dropped the volume by about 2dB, you should have heard the bass these bad boys -- er, Bulldogs -- were pumping out. It would have had anybody searching for the hidden subwoofer, believe me. But more important than sheer output, these speakers sound amazingly solid and detailed through the bass, and unlike a maladjusted subwoofer, they do not impose the same signature on all bass lines on all music. They were remarkably well behaved when called upon to be so. Eric Claptons "Blue Eyes Blue" from the aforementioned Chronicles CD had the Bulldogs giving low bass the back seat in favor of the cello for a rendering that was stirring, cuddly warm and convincingly balanced. The Cliffhanger Bulldogs are every bit as tenacious as their namesake, but they are also orders of magnitude more graceful -- and beautiful to look at! They are fairly low in sensitivity, and prospective purchasers should probably err on the side of having too much power rather than not enough. But, paradoxically, the Bulldogs seemed to be able to make do with less power in a larger room. Even Conrad-Johnsons 60Wpc MV60 did a plausible job of pushing the speakers. This was surprising in light of Doug Schneiders observation that 75Wpc were not enough in his room -- a room not much larger than my smaller room. I can only now surmise that it wasnt his Blue Circle BC2 monoblocks or the speakers that were at fault -- it was his room. The Bulldogs are not simply smallish speakers for use in a small room. They are speakers that come into their own in a larger room. All of this makes the Bulldogs a prime choice if you are looking for a stand-mounted, décor-friendly speaker that sounds as large as those that your significant other would never allow in the house. Do the both of you a favor and check out the Bulldogs at your first opportunity. Price: $3699 USD per pair.